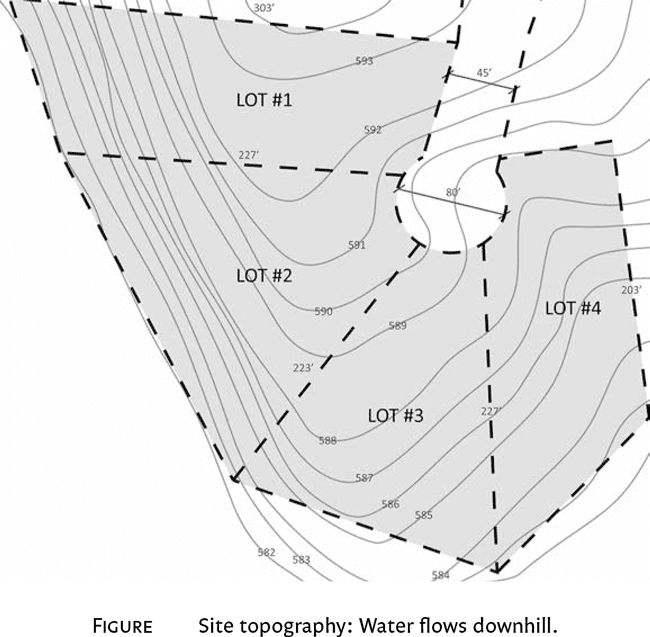 Next, look for natural drainage patterns when investigating potential building sites. If you take a close look at the topographical map of the building sites below, some of the lots have low spots in the middle, probably about where a house would sit. Having water coming downhill toward your home’s foundation from all directions, even with the slightest slope, is not the preferred drainage plan and can lead to lots of costly problems in the future. If this is your situation, it will require designing alternative drainage routes and installing stormwater management controls. We’ll discuss the importance of managing storm- water onsite. For now you just need to make certain that you are selecting a building site where it will be possible to establish positive water drainage away from your foundation. Verify that the site does not have flooding or access issues, or is not in a valley shaped like a bowl, making it impossible to manage stormwater drainage, or at the least, very expensive. To take this concept a little further, though, it’s important to note that water also runs down a roof and down the wall and basement assemblies too. So in designing the home, make sure you establish a drainage pattern that provides a path to get water o and away from your home in rain and wind-driven storm events. inking ahead at this early point in the process will pay o many times over later in money saved on basement and foundation water management and on maintenance to repair water damage to your home. 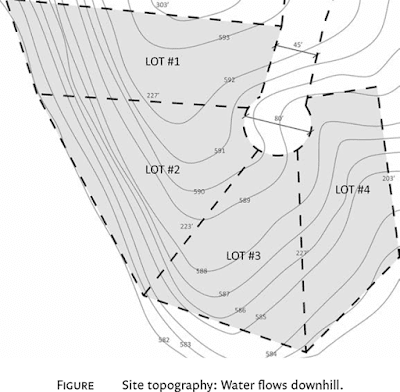 Your site management plan should include effective temporary (i.e., during construction) erosion controls and stormwater management. You don’t want to lose your valuable topsoil that is ex- posed during the construction of the home. Silt fencing has long been recognized by building codes for meeting temporary erosion control standards, but other more natural materials work as well. Many green builders use straw bales to line the lot.